Filed to: Superleggera Desmodromica!Filed to: Superleggera Desmodromica! Riding the 1098 away from Southern California Ducati came with a warning. Three busted-up 1098's sat in the repair queue outside the shop. As the foreman explained, the monobloc brakes could very easily pitch you right over the grips or low-side you onto the tarmac. With those images fresh in mind I rode around the shop a few times, through a few intersections, and up onto the freeway. There I found riding the 1098 in a straight line is an exercise in torture. With each passing mile a thousand other Ducatis cried out in pain. Turn, they said. The 1098 is the latest in superleggera motorcycles from Ducati. 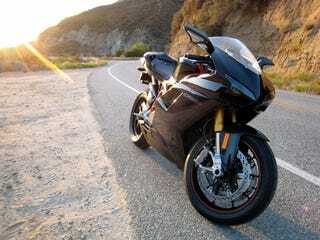 This one is a black S version - currently the most leggera (that means light) of Ducati superbikes. Following up on the controversial design of the 999 with a return to the visual references of the 998, the machine not only looks the part of a purpose-built racing motorcycle, but acts it too. So much so that riding it demands a vital measure of respect for the machine — a respect hovering above machine lust. Not the airbrushed phantasy robot girl or similar message board style machine lust, either. The 1098 is very real, and it will act upon your corpus in a very real way. Of course, the 1098 also delivers genuine entertainment. Hit the starter button on the 1098 and the sound of a churning electric motor gives way to that of infernal combustion. At idle the Ducati sounds like a cement mixer full of volcanic rock and grade eight lag bolts. Blip the throttle and the tune instantly changes. The Testastretta Evoluzione L-twin is the culmination of the decades long Ducati exploration into desmodromic valvetrains. The Ducati twin contains no valve springs, instead employing positive valve control at all times. There is never an instant where any valve isn't held mechanically to its task by a set of camshaft lobes - from idle all the way to a near 11K redline. The next few rides on the 1098 went up into the Angeles National Forest and came with the realization that the 1098 should come with a couple of free coupons to Freddie Spencer or Keith Code riding school. Positive valve control gave way to untold engine revolution. The torque of the 160 horsepower L-twin arrives early and stays around all the way to a peak at the 8000 rpm mark. Top horsepower hits soon after that at 9750 rpm. A planned couple of hours up through Big and Little Tujunga canyons turned into days of countless many more. Look. Lean. Roll on the throttle. Do it again. And again. Grin wide. On a stopover at the well-known riders' haunt Newcomb's Ranch, the telltale wail of an inline four ripping up the hill silenced the hangers-out momentarily. A second or so later, some hotshot was dragging knee-puck through the corner out front at a mean clip — at least a century, if not more. When he pulled back around to the parking lot and shed his helmet, another rider offered a friendly jab that he take his skills out to Willow Springs. Riding at the limit of adhesion is where a motorcycle like the 1098 begs to be ridden, even if I didn't feel like exploring the boundaries of that limit atop sheer cliffs or in the company of asphalt trucks. This is the 1098. A racing motorcycle with turn signals and vestigial rear-view mirrors making up its very thin street disguise. A two-wheeled suspension of disbelief. A set of brakes that with the slightest pull of two-fingers scrub velocity at a tremendous rate, while making the sound of a decelerating TIE fighter. Compromise is not part of the 1098 equation. The motorcycle is simply brutal in its finesse. One wrong move, one fleeting split-second of target fixation, one pull over the line on the brakes, and it's over. The 1098 can be ridden on the street, but calls out for the track with every revolution of its desmodromic core.